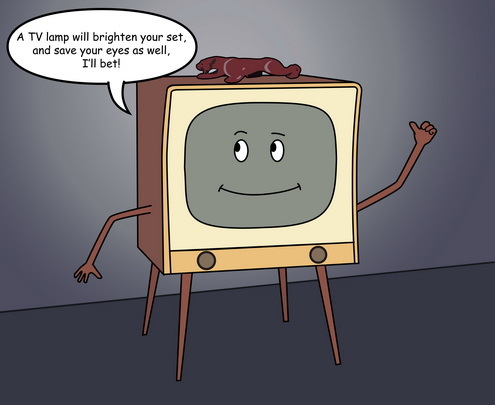 Everything about vintage TV lamps! 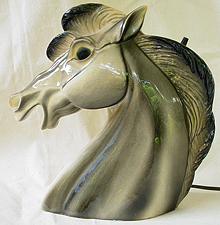 How about this…a Royal Fleet lamp that I haven’t seen before! It seems like after so many years I’d have seen them all. Finds like this definitely keep things interesting, and makes me wonder what else is out there. If you’d like to go for this one, it’s eBay auction #120373433990. Go for it! I’ve started the process of adding lots of internal links throughout tvlamps.net, and it’s definitely a long-term project. An example is the People and Faces page, where I’ve made links to the various manufacturers where they’re referenced. This will make it easier for people, particularly those not familiar with the navigation of this site, to find the information they’re after. What a concept! 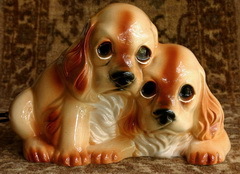 I can’t say where I heard this, ahem…, but a certain party (wink-wink) is going to list a Claes Cocker Spaniel TV lamp on eBay Saturday night at 8:00 central time. It’s supposed to be in perfect condition, and the seller’s word is beyond reproach… they’re a close personal friend of mine! Now isn’t this just the coolest thing? 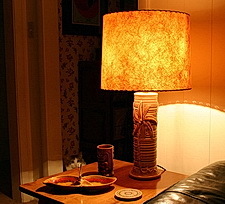 I’ve been contacted by Collectors News magazine to participate in a sort of Q&A about TV lamps. I’m not sure what issue it’ll be in, but I’ll keep y’all posted! Also, I’ve got a really big announcement to make, but I’m going to wait until I complete a spiffy graphic to go along with it, probably mid-week. 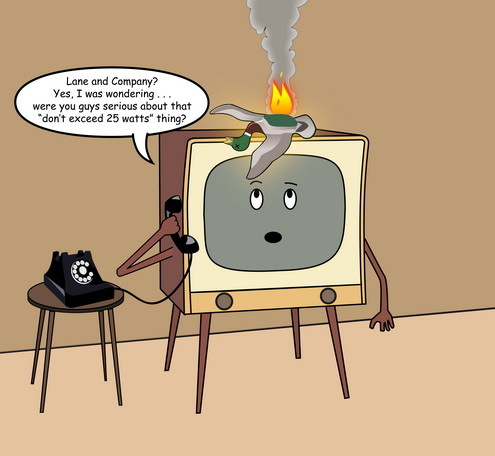 I can’t count the number of times that I’ve received inquiries regarding the purchase of lamps that appear on tvlamps.net, lamps other than those in “The Store”. This usually is the result of confusion regarding the site as a whole, many believing that the entire site is a commercial venture. The reality of it is that only the smallest portion of the site pertains to retail. It’s primarily about sharing information, and I can’t come up with a better way to differentiate between the “display” lamps and the “for sale” lamps… I don’t know how to clarify it further than I’ve done already. Given the number of visitors to tvlamps.net, I suppose that the percentage of folk who misunderstand the site’s layout is extremely low, and my concern isn’t based on any impatience on my part, but rather my desire for a clean layout and clarity of design. Clearing up that confusion is something I’ll be working on, but this issue has prompted me to rethink my stance on the lamps in my collection. As is often said, everything is for sale for a price, and I’ve decided to accept offers on any lamps on the site…any lamps that I own. Many, many lamps are presented on the site through the kindness of others, and are not in my personal collection. The line, “photos courtesy of…” is a definite giveaway. I don’t own those, and in 99% of the cases, I don’t know who currently does. So, if you really want a lamp that I own, make me an offer. I would be willing to sell some of them at a typical market value, whereas the value I’ll place on others will clearly reflect my reluctance to sell… but it certainly doesn’t hurt to ask! Here’s my completed “Mr. TV” image! I’m not sure where I’m going with this, perhaps nowhere, but it could turn into an on-going cartoon/comic strip… it’s all about finding the time to do it. We’ll see! 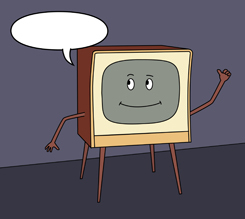 I’m not sure what got me going on it, but I was playing around with Adobe Illustrator and came up with this cartoon TV in the style of old ads and cartoons. Illustrator requires a different method of working than Photoshop, the program I’m used to, so I did this while experimenting with AI. Remember the “Let’s all go to the lobby” clip that they used to show at the drive-ins? That cartoon featured marching hotdogs, drinks, etc., and was certainly on my mind when I conceived “Mr. TV”. I included a word-balloon so that a caption might be added, but I haven’t been able to think of anything clever. So, dear readers, I’ll throw it out to you for consideration… what are your caption ideas? It’s hard to see in this small version, but he’s pointing with his left hand towards the top of the cabinet. He’s not finished, and I’ll probably add a TV lamp, so you might take that into consideration. The wife and I decided to spend Saturday hitting area antique shops in the never-ending quest for vintage pottery. We found some cool stuff, but only after sifting through a lot of “junk”. Sound familiar? I suppose the thing that really bugs me on such outings is the incredible number of “antique malls/shops” that don’t sell antiques. Actually, in theory at least, the term “antiques” refers to items at least 100 years old, furniture more often than not. But that’s not usually what I’m after, and it’s the word “collectibles” that more closely describes the things I seek, smaller things, things not quite so old. 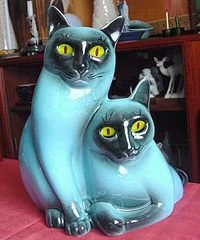 (I believe mid-century lamps fall nicely into that category) A great number of folk are searching for just such collectibles when they go antiquing, and most places cater to just such shoppers. Then there’s the ones that don’t have antiques, that don’t have collectibles. They’re all about catering to this sort of faux-nostalgic junk that I have an array of creative names for: country-chic, granny-chic, and a few that I won’t repeat here. One can recognize these places the moment you enter the door, as the pungent smell of potpourri is positively lethal. A quick scan of the establishment will reveal all sorts of rustic/victorian-era things, most crafted less than five years ago and painted in pastel shades of blue, pink, or green. Plenty of decorative things made from tin will be in evidence (hand-painted watering pails and the like) as well as sand-sculptures of dogs and children. Did I mention the eye-watering stench of potpourri?